People are always asking me about my favorite travel destinations, inevitably the conversation always includes Thailand. It began on our very first experience to Krabi, located on the west coast of southern Thailand, along the shores of the Andaman Sea. Starting with the transfer from the airport it was obvious this was going to be a very interesting trip! Since there are no roads linking this peninsula to the mainland, this included a car, a boat, and a tractor with a trailer. We stayed at Rayavadee, which is an amazing hotel, ideally situated on the Phranang Peninsula. We chose to stay in a pool pavilion, which is almost like a tree house in the middle of a jungle-like atmosphere and even included our very own plunge pool. 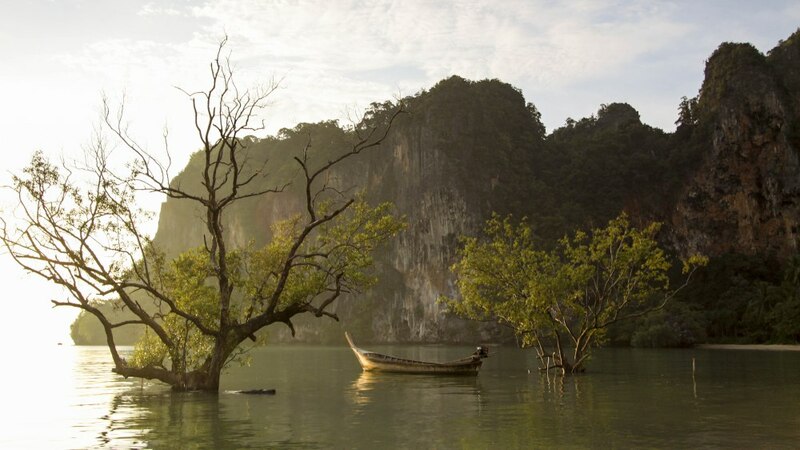 Rayavadee is centrally located between three separate beaches, picture being in the center of a green triangle with each of the points being a beach: Railay, Railay East, and Phra Nang each with its own distinct atmosphere. As you meander through the maze of walkways you begin to encounter sounds like you have never heard before coming from the trees (this i especially creepy in the wee morning hours when you are heading out in the dark to photograph the sunrise!) Then suddenly you realize that the trees are filled with monkeys! Some of which want nothing to do with you and just go on about their business, however some of the other are very used to travelers and approach you looking for handouts! 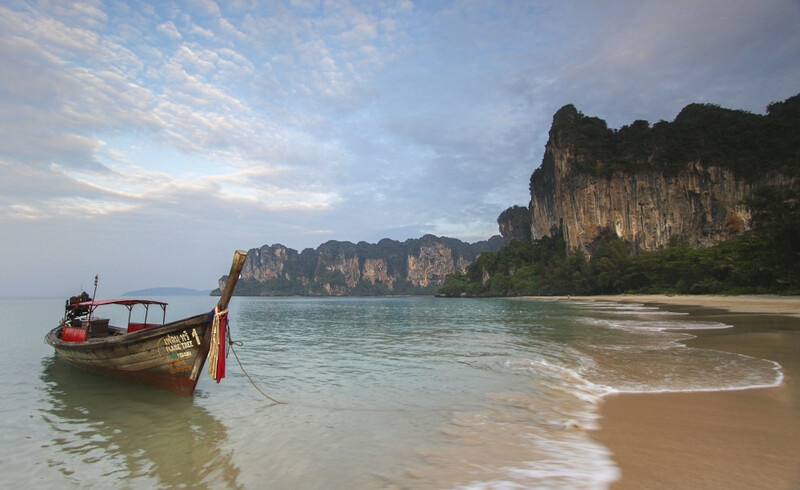 One of the larger and more iconic beaches on this peninsula is Phra Nang. It is interesting because due to its location unless you are staying at one of the surrounding hotels (like Rayavadee) it is only accessible by boat, typically a traditional long tail. So it made for a very interesting dynamic in the morning, this sleepy almost private beach slowly bubbles to a boil and by mid-day it is spilling over with long tail boats all line up selling you everything from a cold Singha Beer to Pad Thai or grilled corn……..think food truck concept with long tail boats. I can see where this could be a little off putting to people expecting a quiet, secluded beach paradise, but we knew what we were getting into and we loved it! Your senses are overwhelmed, the amazing smells of food being prepared, followed by the loud droning noise of another long tail trying to squeeze in, not to mention the top notch people watching. It all makes for a very interesting experience, especially with the amazing backdrop of the Andaman Sea. The natural beauty is amazing, but it is the people of Thailand that make it special! To date, i can’t recall experiencing a kinder more helpful culture. You can’t pass someone without hearing the customary greeting of “sawasdee krab or ka.” Just to give you one example of the amazing hospitality we experienced, at the time of our visit to Krabi our son was only 18 months old and by anyone’s standards a very picky eater! Now as you may imagine, not much in Thailand is plain or bland (which is why we as adults loved the food!) so each meal was adventure to say the least! I believe it was at Raitalay Terrace a restaurant located right on Railay Beach where we encountered some of the nicest people in all of our travels. They were always very accommodating to any request we had as we tried to find something to satisfy our little guy. On several occasions, while my wife and i were still enjoying our thai green curry or amazing seafood, one of the members of the staff came over and asked if it was okay if she could take our son for a walk. Don’t get the wrong idea, nothing scary for a parent or far away…….just a simple walk on the beach right in front of us in plain sight. Just enough time for a couple to enjoy their last few bites of their fantastic meal or that last sip of wine while enjoying the sunset. These are the type of things that we continually encountered in the 5 plus locations that we visited in Thailand, not people looking for a tip or credit……just people that love their country, love their culture, and want you to do the same!